Your confidence in mixing lights and darks is about to skyrocket. Loose dyes attract and lock onto these reusable cloths (instead of your clothes! ), so you no longer have to separate your laundry load. Use each cloth up to 30 times! Can I use bleach with Color & Dirt Grabber™? Absolutely. Color & Dirt Grabber™ may be used with any detergent or bleach. Can I use fabric softener with Color & Dirt Grabber™? No. It is advised not to use liquid fabric softener as this may coat Color & Dirt Grabber™ and reduce its effectiveness in absorbing loose dye. I prefer to separate my laundry into light colors, dark colors and whites? Can I still use the Color & Dirt Grabber™? Even when separating your clothes, dyes bleed into your laundry giving your laundry a dull or dingy look. This dinginess is most noticeable with whites making them look grey. The Color & Dirt Grabber™ will absorb this loose dye and grime keeping your wash water cleaner, which means your clothes will be brighter. 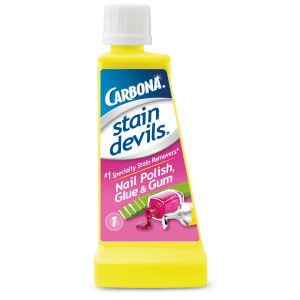 I mistakenly used my Color & Dirt Grabber™ beyond the recommended 30 washes and my clothes are all pink. What can I do? 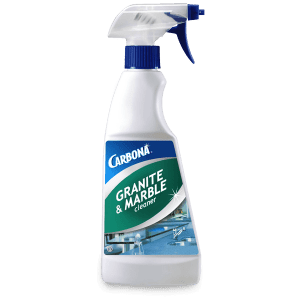 Don’t worry, Carbona has the solution! We frequently refer to this as the “red sock syndrome” – red sock mistakenly ends up with the whites or colorfast colored clothes and turns everything pink. Carbona Color Run Remover™ is formulated to correct this kind of laundry accident. I am a quilter, can I use the Color & Dirt Grabber™? Absolutely. Our consumers who are Quilters have contacted us telling us how great Color & Dirt Grabber™ is in absorbing loose dye when washing their fabric. Do not overload washer, as it will restrict Color & Dirt Grabber’s ability to move freely through the wash in absorbing maximum dye. New colored clothes should be washed separately up to 5 times, as excessive dye may be released. DO NOT use liquid fabric softener as this will coat Color & Dirt Grabber™ and reduce its effectiveness in absorbing loose dye. PLEASE make this item more available in stores! I buy them in bulk for the closet store to me and now they are no longer going to carry them! PLEASE! They are the best thing since sliced bread. Make my laundry time so much easier and efficient. I LOVE them! I have been spreading the word and supplying my family with this product every chance I get! Please bring them back to the store near me! Thanks for making this product! I first bought Shout wipes to try something a little cheaper. 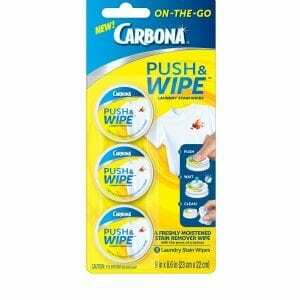 Cheaper was right I returned them to buy the Carbona cloth it was awesome!!! You can buy them only At JoAnn Fabric so far that I’ve found. You can also use a 40% off coupon. Disposable cloths (e.g. Shout Color Catchers) are too thin and slip right through the gasket in front load washers. Check your washer’s drain filter and you might find one or two. Those who have seen the “suds” or other error codes on their washer know what I mean! My local Jo-Ann Fabric store stopped selling them in favor of the disposable ones. Someone please recognize the problem and label the cloth type catchers for front loaders. Maybe the stores will be more likely to carry them! They work great! I used the Color Grabber Cloth this weekend and it seemed to work great. I used it with a red tablecloth (BHG) and some towels, though, and my white towels ended up pink. I suppose I should have known to wash the tablecloth by itself since the tablecloth colored other items the last time I washed it. I will rewash the towels with the cloth and see what happens. No question here…just a big THANK YOU for bringing these back on the market. When they were discontinued and ‘replaced’ by the paper ones, it was a big disappointment. Nothing works as well as your cloth ones! Thank you for bringing them back! I had purchased these from a home shopping net work, a long time ago and they no longer carry them. I am SO glad I found them here. They are wonderful and work well !!! I just bought 4 of them , and I WILL order MORE as soon as these have done their job !! Worth every penny !!!! You won’t be disappointed !!! LOVE these! They work great. I am glad they are available to buy online, since for some idiotic reason, our Walmart has stopped carrying them (typical of them!). Another plus: when they have done their color-catching job, they can be soft cleaning cloths for dusting or whatever. Beats everything else, hands-down. Totally awesome product, and no waste! THIS PRODUCT IS A MIRACLE WORKER. I give it a 5 rating and want you to know that it gets whites whiter and no more pink underware. It is the best product and please never stop making it. My friends did not believe me so I put a red tee shirt (never washed) in with my whites and the only cloth that came out with any color on it was you color grabbers. Fabulous product. One happy, satisfied customer. Found these several months ago at local Wal-Mart and was VERY impressed with the results when I used them. Unfortunately WM no longer carries them, nor do our local Targets, grocery stores, hardware stores, etc. Very glad to see I can order them here. Surely would love it if you could get them back in our local stores, though. I bought this cloth and was amazed to see all the dye it caught. when I needed a new one I went to the store and it was not available so I bought the Shout color catcher. In the 3 loads I’ve used them, all the Shout sheets have come out still white. What good are they doing? 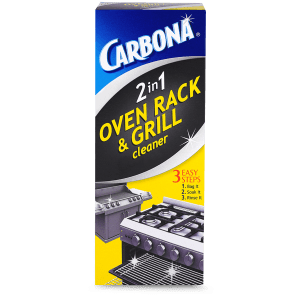 I will be seeking out Carbona again! 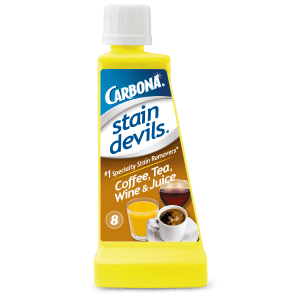 I have been using the Carbona “Color & Dirt Grabber ” for over 20 year!! with your cloth starting to get just a little grey after using a new one a few times. So what that is telling you is that your clothes are really not getting as clean as you think. out with the throw aways. They are NOT ANYWHERE as GOOD. I washed a cheap pair of black leggings with my other laundry before realizing how much dye would leak. 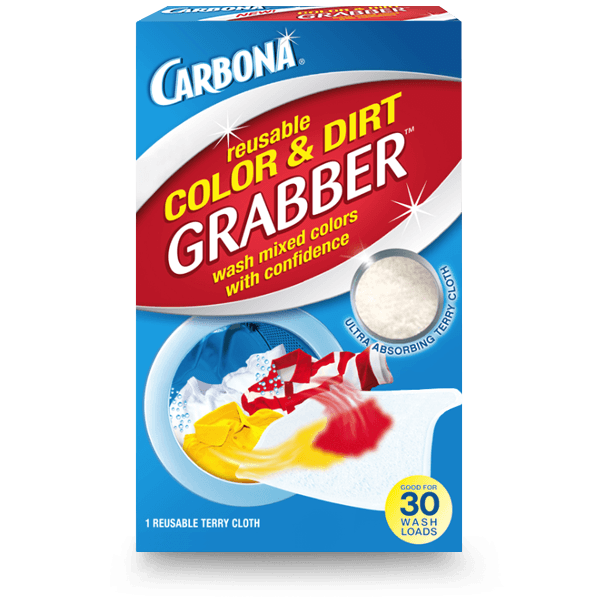 The Carbona color & dirt grabber LITERALLY saved my wardrobe. Actually, also saved me hundreds of dollars in replacements. 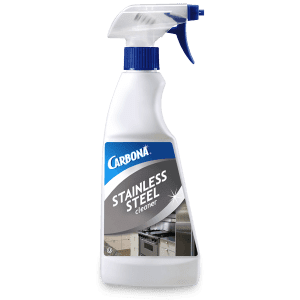 Thank you Carbona!!! Please make this product available in stores again. It is superior to the one-time use one! Not to mention a whole lot less wasteful. Thank you!